This portrait was probably taken of Eliza Steen-Johnson shortly after her arrival in California. "Eliza Johns was a spirited person. At age nineteen, in 1843, she eloped from her parents' home in County Antrim, Ireland, with John Johnson from Oldstone, Ireland. 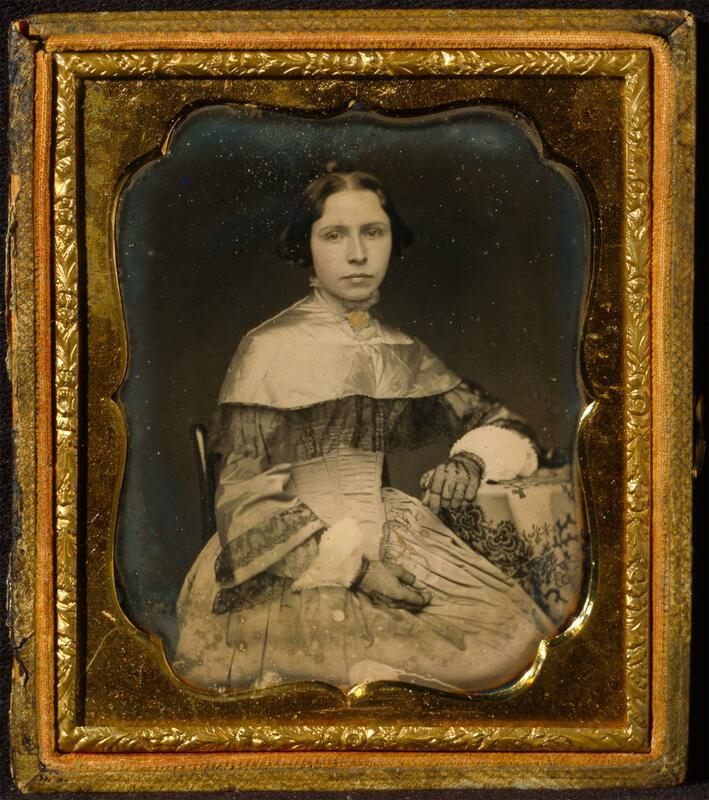 During the Gold Rush they came to San Francisco, In "The Lace House," their drygoods and millinery store on Sacramento Street just off Portsmouth Square, Eliza modeled clothing for the miners who brought in their pokes filled with gold dust to purchase gifts. About 1863 the Johnsons, with their growing family, established a home in Oakland." Additional information regarding the life of Eliza Steen Johnson from Curator's personal research file, added Dec. 3, 2004: Elliza Steen was born in Antrim, County Antrim, Province of Ulster, Ireland, June 22. 1824. Eliza was the fourth daughter of eight daughters and one son. Her Parents were John and Margaret Steen. She was married August 24, 1843, to John Johnson of Oldstone, Ireland, and the same year they left for New York where they lived for some eight or nine years until they moved to california in 1850 at the height of the Gold Rush. Eliza died December 10, 1899, and was buried in the family plot in Oakland.